A plane ticket to South Korea costs hundreds of dollars, but money is no object for 20 DeVaney Elementary School students who immerse themselves in Korean language and culture during an afterschool course taught by two native South Korean college professors in Terre Haute. "This is a chance for these students to see another culture since many of them may not have the opportunity to do that otherwise," said Indiana State University's Yong Joon Park, an associate professor in the Bayh College of Education's department of teaching and learning. "We want children to be open-minded about other cultures and be able to compare their culture to others. This program gives them a chance to do that." Park and Youjin Yang, an instructor in the education department at St. Mary-of-the-Woods College, worked with DeVaney Elementary School principal, Michelle Nutter to begin hosting the 90-minute Korean language and culture class in January. Sponsored by a grant from the Chicago Korean Education Center of Korean Counsel in Chicago, the funds support the purchase of snacks, instructional fees and teaching materials to help teach Korean language and culture as a part of an afterschool program for third- through fifth-graders at DeVaney Elementary - a Title I school in Terre Haute. While the funds only allow for 20 participants in the program this semester, nearly twice as many children signed up. "It's great to see that so many parents want to expose their children to another culture," Yang said. "What the students learn here is a lot like a social studies class. Living in such a diverse world like we do today, it's important that the students know about other people and places in the world and in this program we focus on Korea." The classes expose students to general knowledge about Korea, the language and the culture by introducing them to children's songs, holidays, food and sports found in South Korea. Students also practice Korean greetings and learn to write their names using Korean characters. "During our first class, the students asked about Korea's flag, so we added a part to teach about the Korean flag at the next class," Park said. "We want to teach the students about things they're interested in, so if they ask questions and want to know about things we want to try and get those facts into the class. We use the concept of emergent curriculum in education." As one of two Indiana State students who assist with the class, Janna Newell of Terre Haute loves seeing the enthusiasm students have for learning about another culture. "This is an amazing opportunity for these students because this program is really responding to a societal need to make people aware of other cultures," said Newell, who is working on a minor in early childhood education at Indiana State. "In an ever-changing and diverse society, we need to recognize that there are other cultures other than our own. This program is giving these children that edge now and it's fun to see how excited they are to learn." 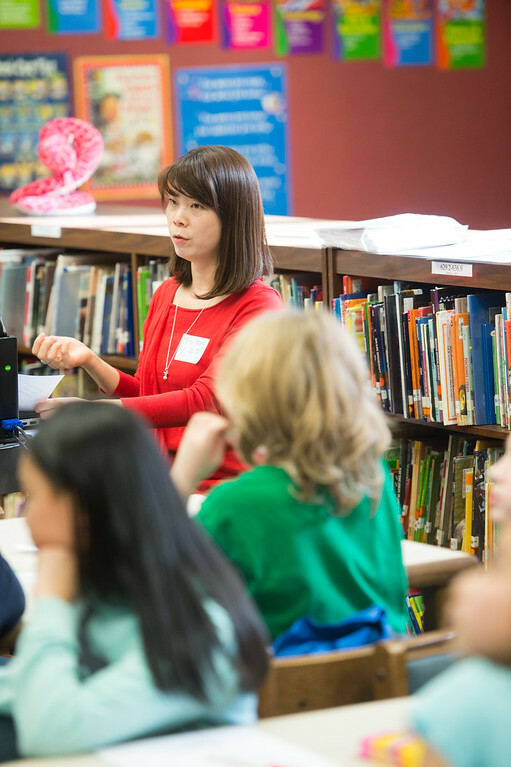 http://photos.indstate.edu/Other/Media-Services/Media-Education/DrParkatDevaneyElementary-2016/i-DDpwct2/0/X2/02_05_16_park_devaney_elementary-7399-X2.jpg - Youjin Yang, instructor in the education department at St. Mary-of-the-Woods College, left, and Yong Joon Park, associate professor in the Bayh College of Education's department of teaching and learning, assist a student during a Korean language and culture afterschool program at DeVaney Elementary School in Terre Haute on Feb. 5, 2016. A grant from the Chicago Korean Education Center of Korean Counsel in Chicago provides for the purchase of snacks, instructional fees and teaching materials to help teach Korean language and culture to third- through fifth-graders at DeVaney Elementary - a Title I school in Terre Haute. http://photos.indstate.edu/Other/Media-Services/Media-Education/DrParkatDevaneyElementary-2016/i-Rt53689/0/XL/02_05_16_park_devaney_elementary-7343-XL.jpg - Youjin Yang, instructor in the education department at St. Mary-of-the-Woods College, talks with students about South Korea's location on the globe and the country's national flag during an afterschool program at DeVaney Elementary School in Terre Haute on Feb. 5, 2016. A grant from the Chicago Korean Education Center of Korean Counsel in Chicago provides for the purchase of snacks, instructional fees and teaching materials to help teach Korean language and culture to third- through fifth-graders at DeVaney Elementary - a Title I school in Terre Haute. Twenty DeVaney Elementary School students enrolled in a Korean language and culture afterschool course taught by professors from Indiana State and St. Mary-of-the-Woods College.